La Casa Grande from the courtyard. Living Quarters off the Loggia and the Sleeping Quarters above the main part of the house with the terrace. …is a charmingly renovated & decorated farmhouse arranged on two independent floors... main for living and above for sleeping. The later is reached by a grassy ramp off the courtyard, the centerpiece of La Casa Grande with its 19th Century vine covered pergola. The compound is surrounded by a terraced garden planted with olive & fruit trees. There’s even a fish pond! The original independence of the two floors has been maintained after il Poggiolo’s reconstruction from 2009 to 2013. The absence of farm animals now allows for the ground floor to be dedicated to a Loggia, LR, DR & Kitchen… plus Laundry Room & Bath below the Kitchen, while the sleeping quarters, upstairs reached by a grassy ramp off the courtyard has an open-space living & dining areas and a service Kitchen. 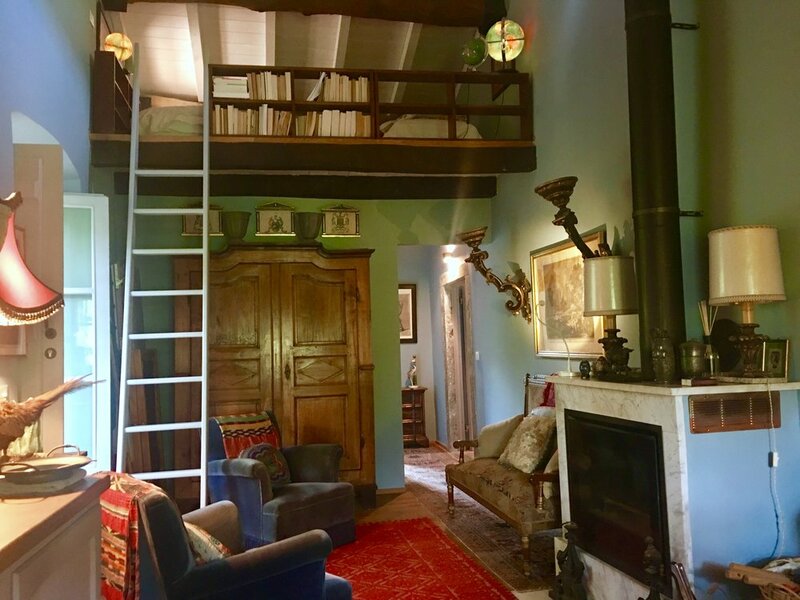 There is a loft above with 2 single beds accessed by a ladder. Off a short corridor is a Bathroom to the left and to the right a separate BR with a door to the Terrace beyond. There are wonderful with views over the historic village of Codiponte and the hills beyond covered with olive & chestnut groves. La Casa Grande is decorated with an eclectic mix of period antiques, flea-market finds and the contemporary, from the furniture, furnishings to the artwork. Outside is a 2,000 square meter… 25,000 sft, is the terraced garden accessed by a door in the cantine and by taking the ramp to the Sleeping Quarters. There is a back entrance to the garden on the way to the Sleeping Quarters leading to the part of the village built around the Castle of Codiponte and a parking area. Information… Minimum Stay: 1 week Euro 950. 2 Weeks Euro 1,600. Extra-night Euro 135. Extra-person beyond 6 persons Euro 25 per night. Final Cleaning/Bed-linens & towels are included in the prices. Wi-fi and Parking are provided and are free. Inquires & Bookings: forrest@youritalianconcierge.com Please specify La Casa Grande and include your dates, full name and address. Thank you. The Salotto of La Casa Grande and is decidedly blue! The Loggia and pass-through into the Kitchen of La Casa Grande. Open-space of the Sleeping Quarters, loft above and MBR beyond. A shady spot outside the Sleeping Quarters of La Casa Grande. The Dining Room with a mix of the antique with the contemporary. Master Bedroom and the door out to the Terrace of the Sleeping Qtrs.